Google recently hosted an event for website owners at their campus in San Francisco called, Pubtelligence. In the afternoon, Amanda Nachman of College Magazine presented a case study on how she was able to organically increase her site traffic by 130% in less than 9 months! She started off by asking everyone in the audience, “who here would like more organic site traffic”? Obviously, everyone raised their hand. The question is, how did Amanda do this on her site so quickly? Below, I’ll share the secrets Amanda used to increase her organic website traffic quickly without spending any money or using any blackhat SEO techniques. I’ll also share how almost every website on the planet can do it the same way. First, let’s define exactly what the site achieved in this time span. I personally worked with Amanda as she went through this process and can attest to the amazing improvements her site made in a short period of time. These are all pretty impressive and are likely something just about every publisher reading this would love to duplicate, but what motivated the action to improve this? I actually met Amanda a little over a year ago at another Google-sponsored event. We talked at length about her website strategy and she was closely looking at how she invested her time in improving revenue, traffic, etc. 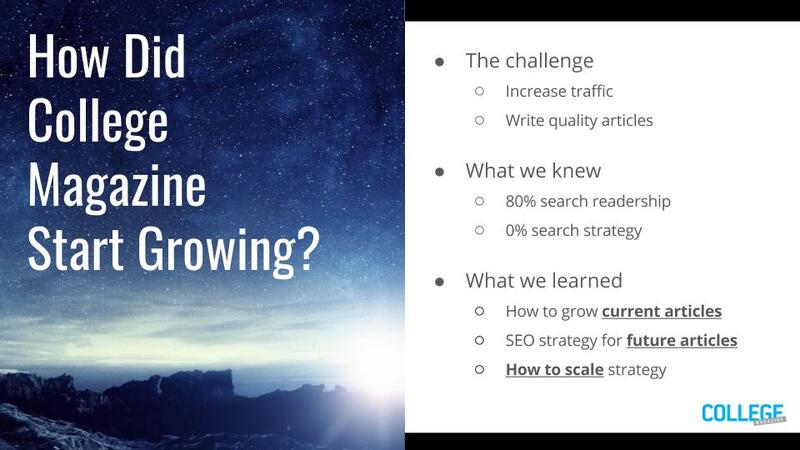 She was struggling with how to scale new content, account for SEO, and ultimately grow revenue in the process. She was zeroing in on the fact that +80% of her readership was coming to her site via organic search, and so she was strongly considering focusing a significant amount of her efforts around optimizing her time impacting SEO and organic site traffic. I shared with her my thoughts, and she agreed to keep me updated on her progress along the way. Below, are the processes she implemented. One of the strategies that top organic search publishers use to increase traffic quickly is to focus on their existing content. I’ve written about this a lot before, and the post below is actually the exact article I shared with Amanda before she got started with this project. 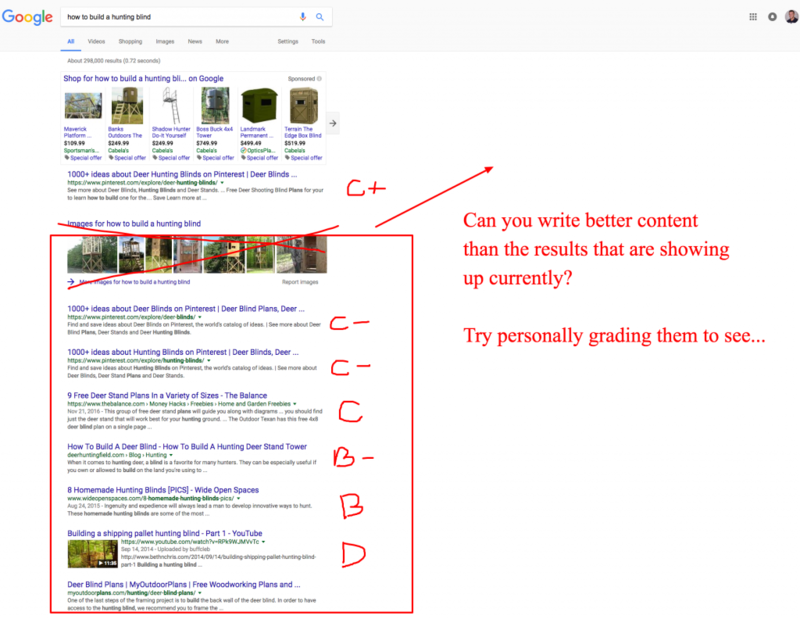 Essentially, publishers should use some type of crawling tool to identify the organic rankings of all of their existing content. This will help them understand what existing content they have that is generating the most organic traffic and will also help them see content that isn’t… BUT COULD BE! The key to identifying “low-hanging fruit” here is to find the content that is connected to high volume searches that is just off of the first page of results. This means, finding keywords that your content ranks for in positions 9-30. By doing this, you’ll be able to see what pages on your site offer the biggest traffic payoffs if you’re able to improve them. There are a lot of tools that will allow you to do this and then filter results so you can make adjustments. 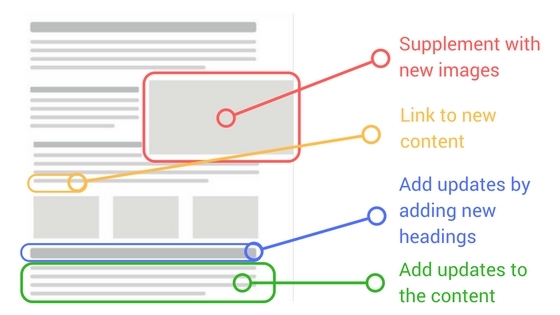 Many tools will offer some advice on how to improve pages. Most of that can be ignored. We’ll get to how Amanda did it here in a second. The tool I recommend for this process is SEMRush, but it is more expensive than some of the others. There are a handful of good ones out there. You could always simply subscribe for one month, then cancel once you have the data you want. 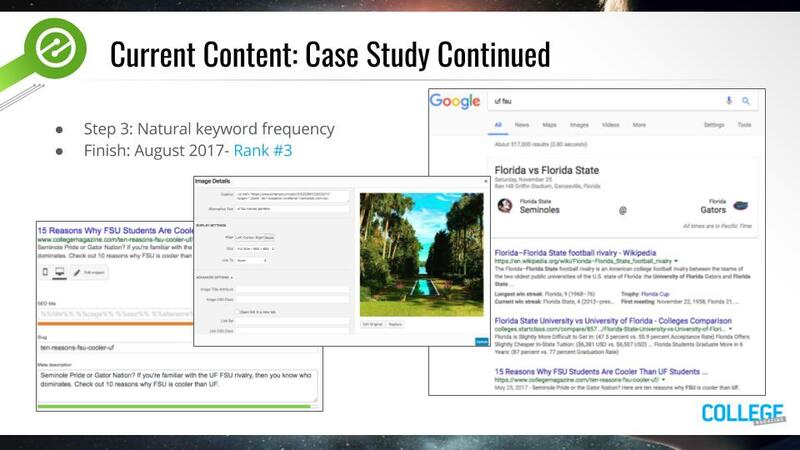 Once the opportunities were identified with existing content, Amanda talked about how she effectively went about improving the rankings for each individual page and keyword. This sounds long and arduous, but in many cases, one page may have multiple keyword opportunities; meaning you can kill multiple birds with a single stone. Amanda emphasized the importance of augmenting content over changing content on these pages. Changing content has the downside of potentially altering the rankings for other keywords that page might rank for, so unless you can do enough research —and understand SEO well enough to mitigate these risks — this is often a preferred no risk strategy to use. Augmenting content simply means adding to the existing content, not altering any of the existing elements. The screenshot and a lot more details of the advice can be found in this post that I wrote (below). Amanda shared that she used this as a rubric when she first got started. Most of this centers around adding new relevant content that is associated with the keywords that you’ve identified as opportunities. 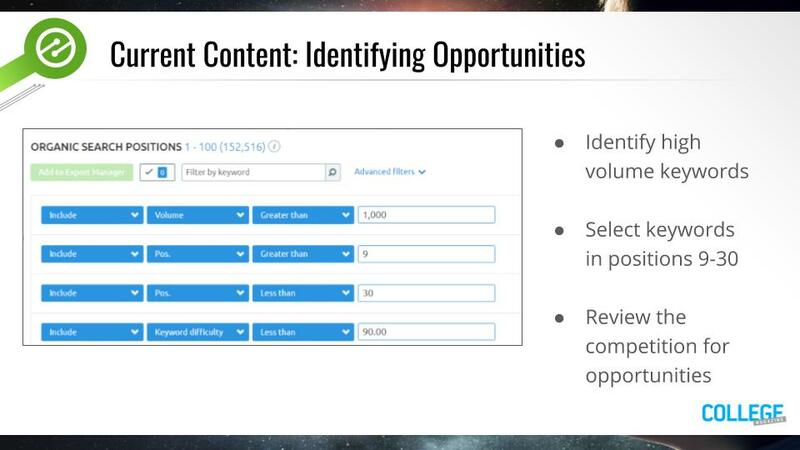 This means creating new sections in the existing content dedicated to answers questions searchers might have that are associated with these keywords. Amanda talked about how she would add new H2 headings and include new paragraphs, images, and other content associated with the keywords she was trying to improve rankings for. She also talked about the importance of including primary sources and competitively targeting the top results for the keywords she was going after. For her, this meant including dynamic links and quotes associated with where information was coming from in the augmentation of her content. Additionally, she would research and identify what the top search results for this keywords would contain and then attempt to go into greater depth and provide better content for the associated keyword than the top results. For her, this meant including dynamic links and quotes associated with where information was coming from in the augmentation of her content. Additionally, she would research and identify what the top search results for this keywords would contain and then attempt to go into greater depth and provide better content for the associated keyword than the top results. To give an example of how she did this, Amanda shared an example of a recent article she was able to significantly improve the ranking for by employing these strategies. 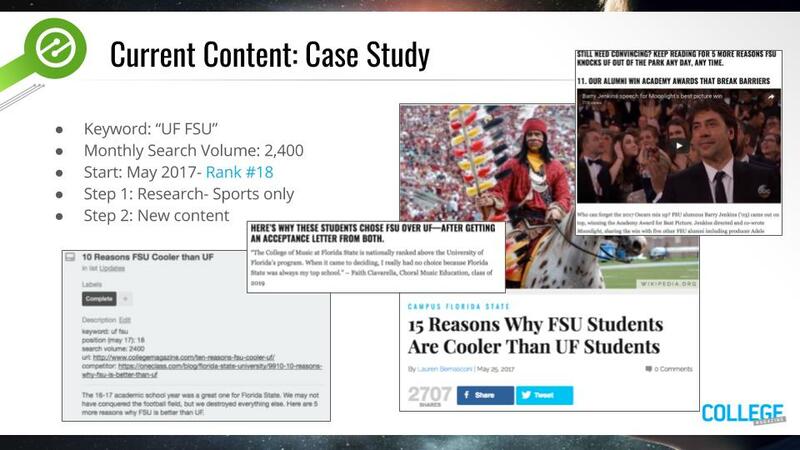 In this example, the high volume keyword in question was “UF FSU”. Amanda mentioned that “UF FSU” referred to two rival Florida universities. When looking at how she could improve the rankings for her page, she recognized that most existing results focused solely on the sports teams for these respective schools. This left out a lot of people that could be searching to compare more than just the football teams for these two universities. Amanda would have only realized this by doing competitive evaluations for existing results. She ultimately decided to augment the content with more comparative information about both schools; including new keyword sections, images, primary sources, videos, and more. 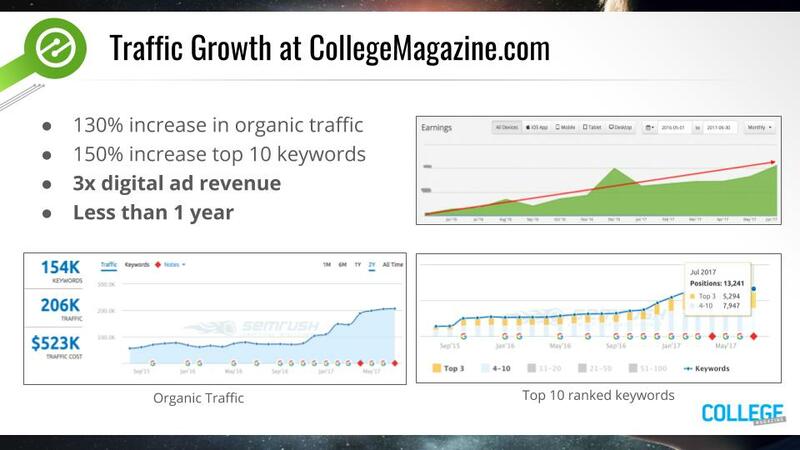 After only a few weeks, CollegeMagazine.com moved from the #17 result for this keyword to #3! This is a massive jump in rankings and organic site traffic for this keyword. 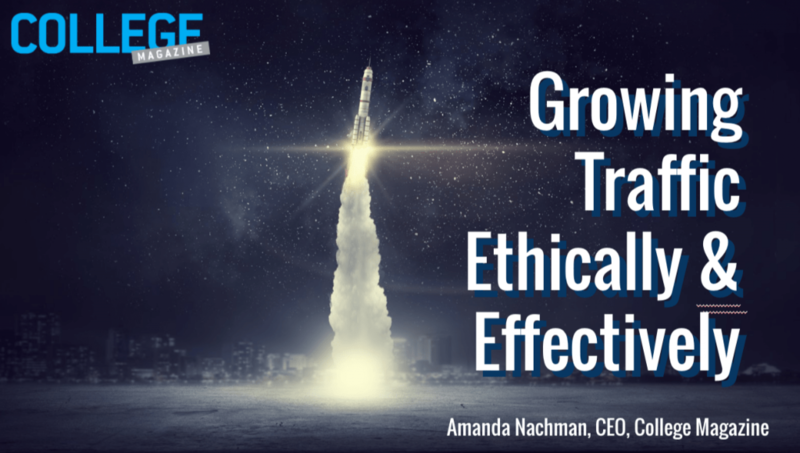 While Amanda admits that augmenting existing content was a big part of her early site traffic growth and development, she went on to talk about how she was able to use a lot of these same principles when creating her new content. Amanda leverages a large team of student writers for content. She joked that a lot of publishers are jealous because of the inexpensive cost of content associated with leveraging students, but was quick to remind everyone just how difficult it can be to employ strategies at scale with a workforce like this. 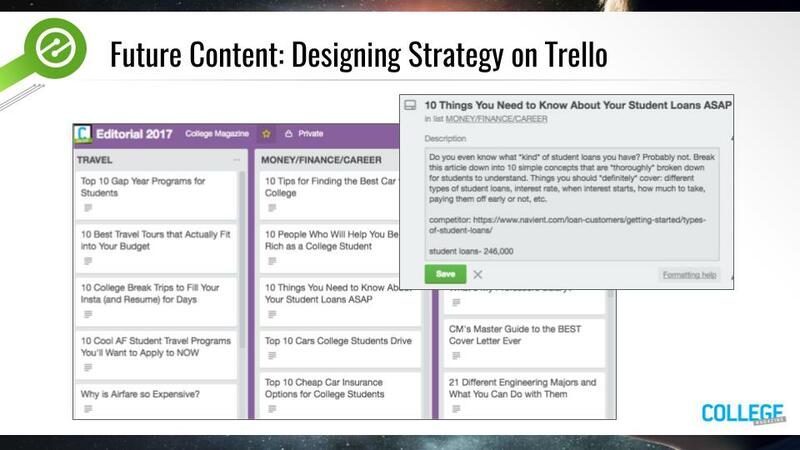 To deploy things like keyword research, competitive analysis at scale, and the creation of quality content at scale, she talked about using Trello to vet new subject ideas. She had students do some very basic research before submitting new topic ideas. She wanted them to check keywords associated with potential articles, and do a quick analysis of the sites that were current ranking for those keywords. Then, someone on her team would greenlight the creation of the content. She talked in depth about how this was a little more work up front but offered way more payoff in the long run. Ultimately, she said she wanted to remove the randomness of ranking for content. This meant that Amanda and her team had to adopt principles across all website stakeholders. 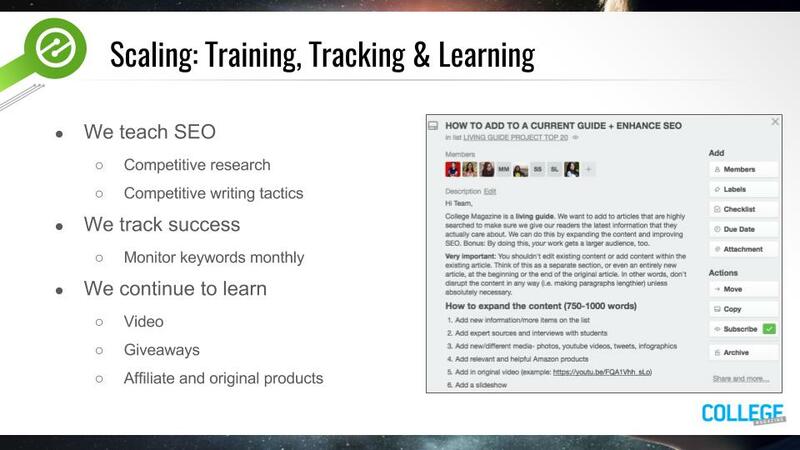 They wanted to teach SEO to everyone (i.e. 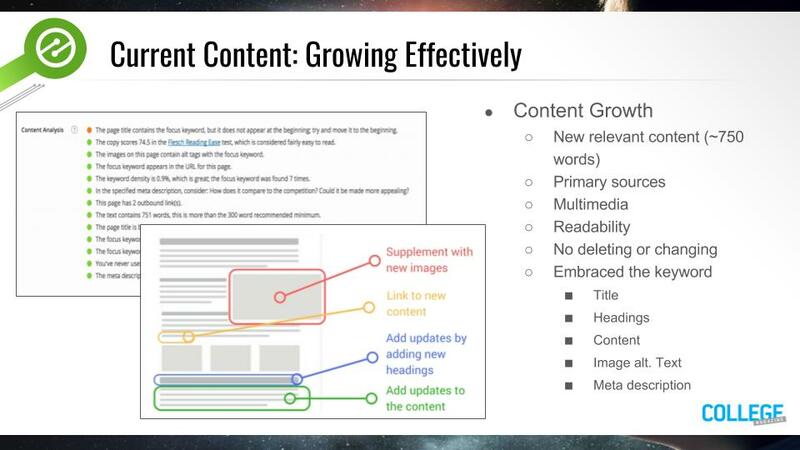 the strategies they used to make the existing content better). They also made it a core principle that they would track all of their efforts to ensure they were investing time wisely. Lastly, they admitted that they were dedicated to investing additional time in new strategies for growing site traffic and revenue; like giveaways, video, and affiliate and original products (i.e. the buildout of their hosted store). Last week, I talked a little bit about how publishers that focus on bringing more value to both visitors and advertisers can benefit a lot; as it relates to increasing ad revenue. However, in Amanda’s presentation, she made it clear that, if this is done correctly, that there can be some major benefits to selling direct deals and sponsored content to advertisers as well. She mentioned that she recently sold some sponsored content based on the fact that her platform offered audience reach organically; beyond just her normal site visitors, social media, newsletter, etc. By offering potential advertisers the allure of long-term organic rankings, the publisher can increase the value of their ad inventory and content space to would-be advertisers. This is something that a lot of publishers don’t bring up, but Amanda talked about how this was a big part of her strategy. 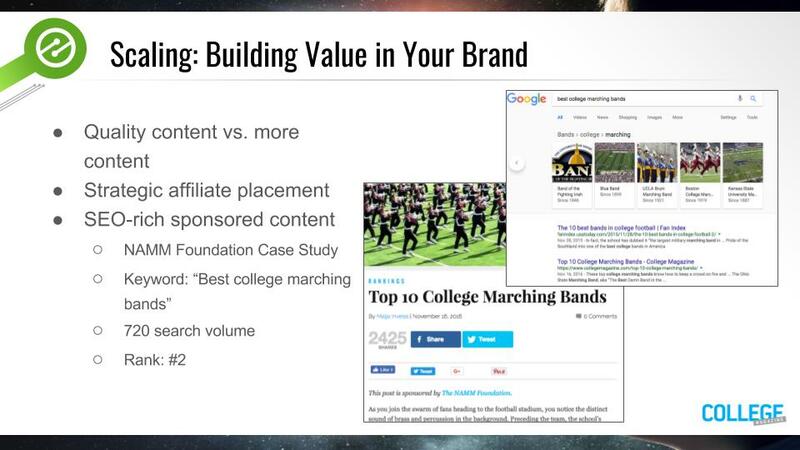 Amanda highlighted that she often pursues these direct advertisers and includes a full media kit for them that includes the example above of a recent sponsor who now currently ranks highly for a high volume keyword on her site. Amanda finished her presentation with an open Q & A. She admitted she is still learning and developing; however, her progress thus far is a great template for all publishers seeking to increase organic web traffic. Just about any publisher can employ the strategies she used to increase the rankings of their existing content, and all publishers reading this can use the strategies she discussed when creating new content. Will this assist publishers creating new websites or even a blog from start to end?